I recently upgraded from Lion to Yosemite. Now using Mail 8.2 the welcome screen shows up with every launch of the program. Dis- and reenabling the IMAP account like proposed here did not fix it. What can I do? Yes, but that did not make a difference as well. I fully deleted `~/Library/Mail/V2` as well as `~/Library/Preferences/com.apple.mail.plist`, rebooted the system, re-added my IMAP account and had my ~50k mails re-indexed. 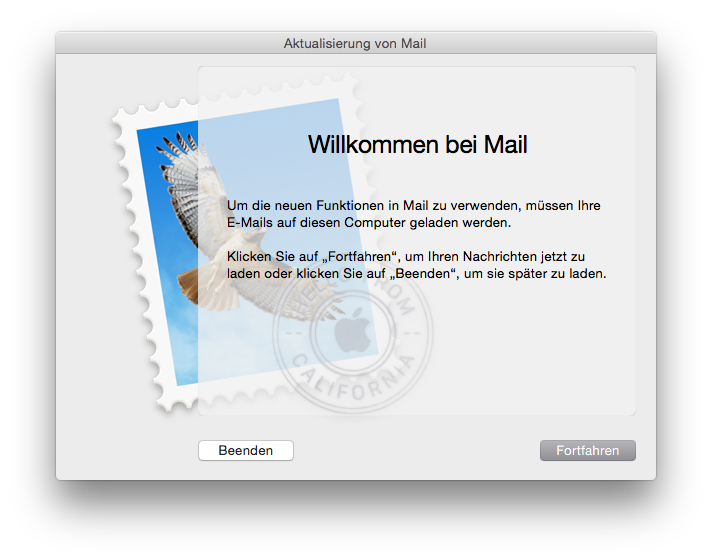 This took about two hours but now Mail.app behaves as expected (at least in this case). Another poor Apple job in being verbose. is the apple watch, i just purchased, first or second generation? HT204665 I am highly allergic to nickel. Are any of the Apple watches nickel free on the skin contact areas? Apple Watch only in Greyscale!